Today's article is far more important than a mere training lesson about some archane financial ratio. The gold-to-silver ratio actually explains much of the history of the modern world. Prepare to learn a ton. 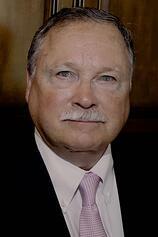 Since 1687, which is as far back as the records reach, the gold-to-silver ratio has varied between roughly 14 and 100. Beginning around 1900, the ratio steadied and remained relatively flat at around 16 because many countries were using gold-and-silver-backed currencies. The United States, France, and several other countries actually assigned statutory limits on what the ratio could be. The U.S. Geological Survey estimates that there’s 17.5 times more silver in the Earth’s crust than gold, which is another reason why the pre-1900 gold-to-silver ratio usually stayed between roughly 14 and 100. "I'm falling asleep here, George. Why do I care?" Did you know that Venice was once the financial capital of the modern world? Venice? Venice was just a medium-sized city! It did not have some huge standing army. Nevertheless, if you were a king in 1425, and you wanted to finance a war, you would probably have to borrow from a Venetian bank. If you were a merchant, and you wanted to open a trading office on Cypress, your representative (maybe one of your precious sons) wouldn't carry a huge sack of gold. He would be quickly robbed and murdered. 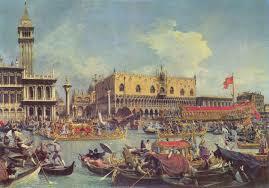 Instead, you would go to a Venetian bank and obtain a letter of credit. Here's why such a relatively small city could become the center of the financial world: In ancient times the gold-to-silver ratio was dramatically different in China and India than it was in Western Europe. For example, the gold-to-silver ratio in Italy might be 25:1, but the gold-to-silver ratio in India might be just 8:1. In other words, a European merchant could buy an ounce of gold in India for just 8 ounces of silver. Why was silver so relatively precious in India and China? Why was gold valued so relatively little? The average person in India and China in the old days was dirt poor. There was no way on Earth that the average person in India would ever be able to save up enough wealth to own a gold coin or to ever conduct a trade in gold. Silver was the currency of the people, and the demand for it in India and China was immense. Arbitrage is the process of spotting a price differential in two different markets for the exact same product and then buying in one of the markets and selling it in the other. The gold-silver trade is one gigantic arbitrage effort. Merchants would buy cheap silver in Europe and sell it for big handfuls of gold in India. Whichever power controlled the gold-silver trade became the economic powerhouse of the world, the center of lending and investment. 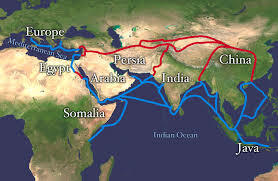 Before a sailing route to India was discovered around the Cape of Good Hope - the southern tip of Africa - Western trade with India was conducted across the Silk Road. 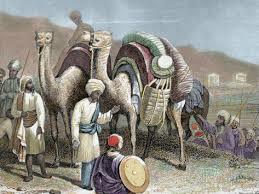 The Silk Road was a dangerous caravan trek over the mountains of Afghanistan and across the deserts of Iran and Iraq. Bandits, sandstorms, and dehydration took an enormous toll. As soon as possible, trade goods were transferred aboard ship and (relatively) quickly sailed across the Mediterranean Sea to their final destination. In the days of the early Pharaohs, Egypt controlled the Mediterranean Sea. The opportunity to control and profit from the gold-silver trade with India made Egypt the center of the civilized world for hundreds of years. Later the Phoenicians (Lebannon) and the Carthaginians (North Africa), who were famous sailors and sea trading nations, controlled the Mediterranean Sea. The Carthaginian traders made an enormous profit carrying the East-West trade, with which they could build fighting ships and hire huge land armies. 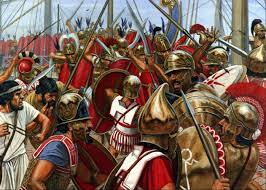 For fifteen years the famous Carthaginian general, Hannibal, terrorized Rome and the Italian peninsula. Hannibal led an army of Spanish mercenaries and elephants over the Alps in winter and surprised the Romans. At the battle of Cannae, Hannibal surrounded 70,000 Roman legionaires and then squeezed them so tightly that they couldn't even lift their arms to defend themselves. All but 10,000 were slaughtered. But then Rome got smart. 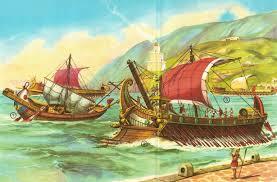 Rome built a fleet of its own and destroyed the fleet of Carthage. By doing so, Rome claimed lordship of the seas and the East-West trade. "Delenda est Carthago," said Cato the Elder after every speech. "Cathage must be destroyed." Rome and Carthage fought three long wars before Rome finally burned Carthage to the ground and slew almost all of its inhabitants. Rome tore down every building in Carthage and sowed the ground with salt, so that nothing would ever grow there. While the Western Roman Empire was overrun by migrating German tribes, the Byzantine Empire endured for another 1,000 years. Because the Byzantine fleet controlled the Mediterranean Sea, and hence the East-West trade, including the profitable gold-silver trade, Constantinople became the largest and richest city in the Western world. But the Venetians were envious. They too were a sea faring power, and they coveted the East-West trade. 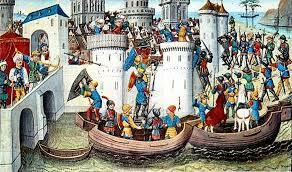 When the knights and soldiers of Fourth Crusade (booty seekers, in reality) needed transport to the Holy Land, only Venice possessed a sufficiently large fleet. "We'll transport your army to the Holy Land, if you do us a little favor. There is an irritating little city (little?) along the way that we would like for you to sack. They have lots of booty inside." 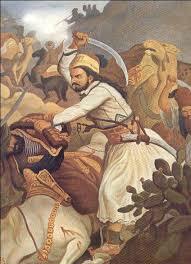 So the Christian crusaders stormed the Christian city of Constantinople and slew all of the inhabitants. Now unbelievably rich with booty, the noble crusaders decided not to bother with the Holy Land, and they went home. In the process, little Venice became the uncontested master of the Mediterranean Sea and the financial capital of the world. What goes around, comes around. For hundreds of years, the Byzantines had protected Venice (the ungrateful bums) and the rest of Europe from the Ottoman Turks. While Constantinople eventually recovered from the sack by the Crusaders and repopulated, it was never able to regain its former strength. In 1453 Constantinople fell for a second and final time to the Ottomans, and Venice would spend the next 200+ years fighting the Ottomans for control of the Mediterranean all by themselves. When the Venetians were devastated by two plagues, the Ottoman Turks destroyed the last of Venetian fleets and took over control of the Mediterranean Sea, along with the gold-silver trade. This control of the East-West trade was a high-water mark in Muslim history. In 1488, a Portugese explorer became the first modern explorer to round the southern tip of Africa in hopes of finding a sea route to India. The Portugese founded trading colonies in India, and the wealth of this tiny Eurpean nation soared. But it was the Dutch who had the foresight to build trading colonies along the west coast of Africa, and they founded Johannesburg in South Africa. Soon the Dutch controlled the Indian Ocean and the East-West trade. 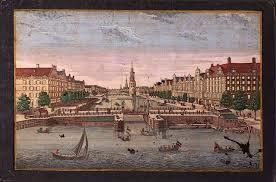 Amsterdam in tiny little Holland became the financial capital of the world. If you wanted to take a company public or if you wanted to borrow a huge sum of money - perhaps to fight a war - your most likely first stop was a Dutch bank. 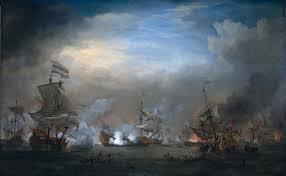 Eventually, however, the British Navy was able to wear down the Dutch Navy and gain control of the seas and the East-West trade - one time by sailing into Holland's chief harbor and sinking the entire Dutch fleet before war had even been declared. 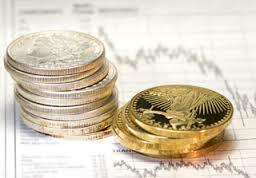 The huge profits of the gold-silver trade moved to London, and London became the financial capital of the world until the end of World War I. London's investments banks (they were called merchant banks in those days) became the bankers for the world. After World War I, the U.S. Navy took over control of the seas, and, not surprisingly, New York became the financial and banking capital of the world. China is becoming wealthier, but until she controls the seas, New York will remain the banking capital.